Congratulations to our latest giveaway winner! Thanks to all who entered and we wish you good luck with this week's giveaway! This week's giveaway is from Sarah of SB Design. She is giving away this great snowflake necklace. Just in time for winter! 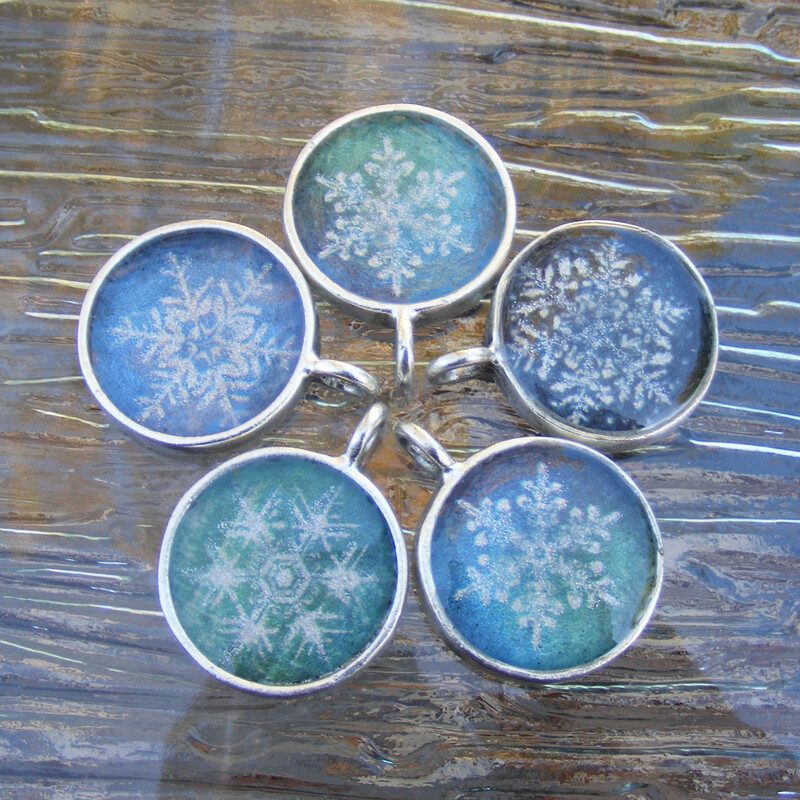 The winner of this giveaway will receive one of these 5 fabulous snowflake pendants. 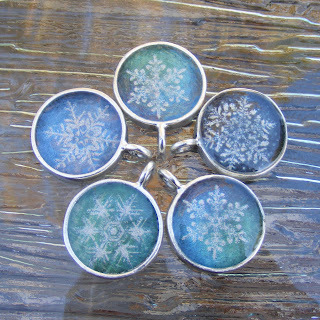 Each design features a shimmering snowflake on a background of vibrant blues and greens. Silver glitter adds a hint of sparkle. 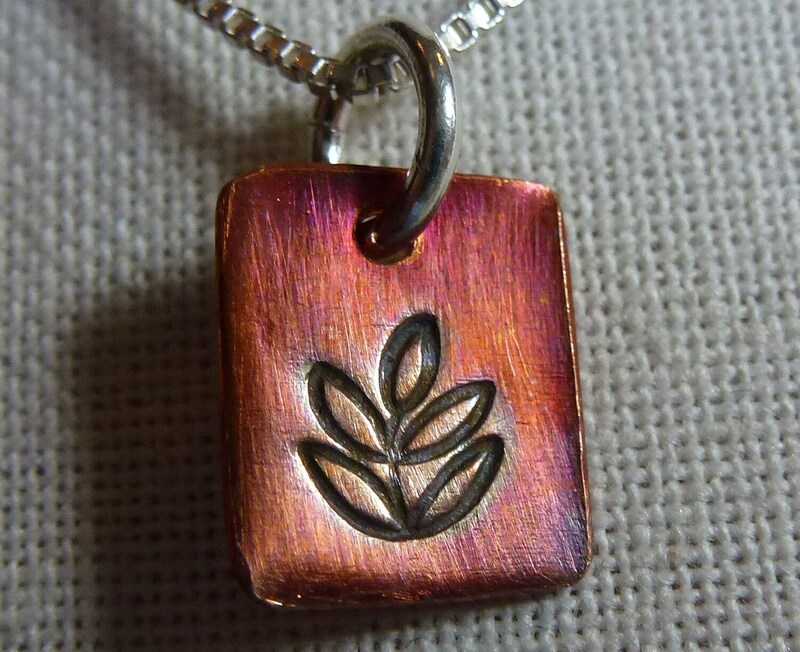 Pendant is silver-plated with a slight antique finish. Comes on an 18" sterling silver ball chain. Open to US and International. Contest ends Saturday, November 10th, at 12:00 noon Central. One winner will be chosen by Random.org. so we have a way to contact the winner! Please leave each in a separate comment, as each comment is an entry (To qualify for extra entries you must do step one above). 1. 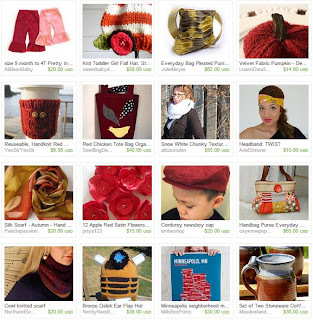 Visit other HandmadeMN team members shops (listed in the sidebar here) and leave a comment(s) here with your favorite pieces. 2. Blog about this giveaway with a visible link back to this posting and comment here with a link to your post. 3. Tweet about this giveaway and leave a comment(s) with a link to your tweet(s). 4. Follow this blog (you want to do this anyway to learn about upcoming giveaways!). Leave a comment here letting us know you are a follower. If you are already a follower, leave a comment anyway, as each comment is an entry. 5. Follow HandmadeMN on twitter. Comment back here with your Twitter link. Existing followers just leave your Twitter link here. 6. 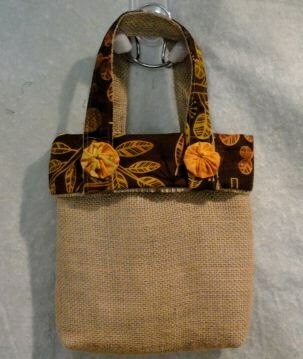 Become a Facebook Fan of HandmadeMN. Comment back here with your Facebook name. Existing fans just leave your Facebook name here. 7. 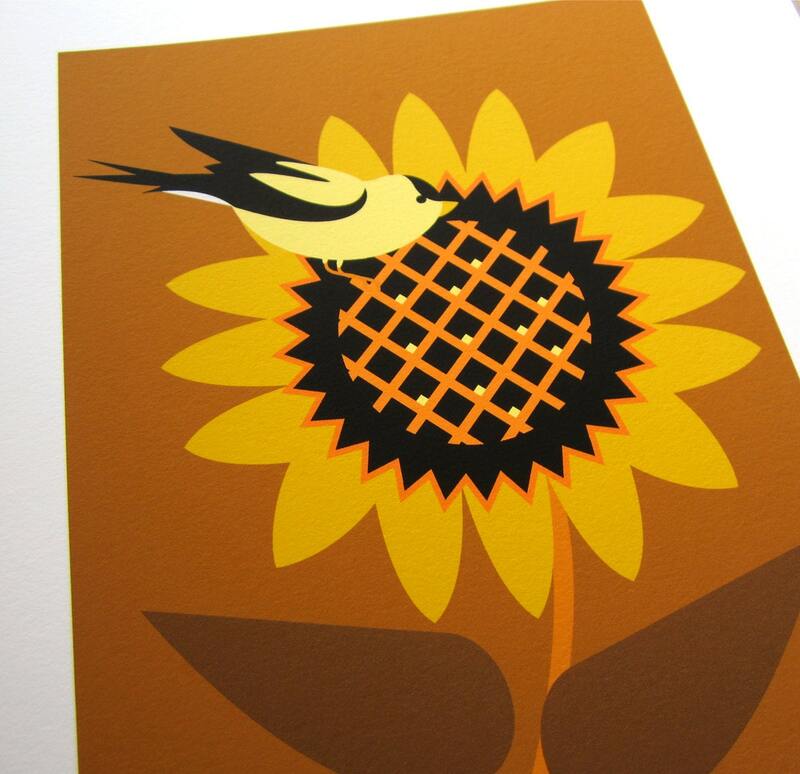 Become a Facebook Fan of SB Design. Comment back here with your Facebook name. Existing fans just leave your Facebook name here. 8. Follow Sarah's blog. Leave a comment here letting us know you are a follower. If you are already a follower, leave a comment anyway, as each comment is an entry. HandmadeMN members are not eligible to win. As I put this together, it's snowing outside. Winter is coming, everyone. Congratulations to our latest giveaway winner! Thanks to all who entered and we wish you good luck with this week's giveaway! 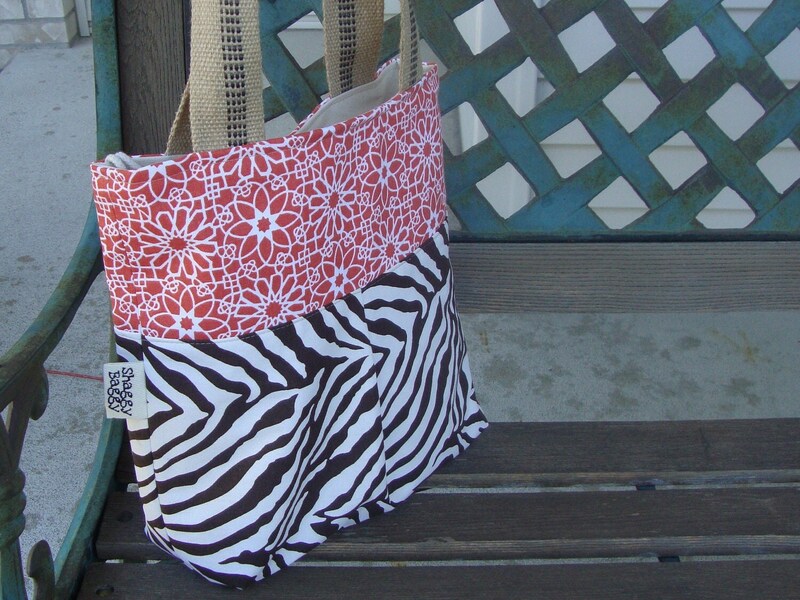 This week's giveaway is from Valerie of Anna Tere Designs. She is giving away useful, yet attractive iphone/itouch/cell phone charging station. Valerie created this iphone/itouch/cell phone charging station to help you get your cell phone and chords off the counter and neatly stored away once and for all. It's great for home use, but be sure to bring it with you when you travel. 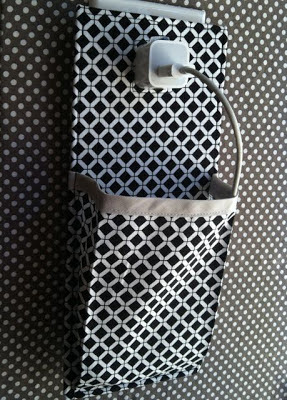 The front exterior is made with a funky black and white cotton fabric, the back of the charger is lined with felt. The station is approximately 4"(wide) by 10"(long), pocket depth 6", and opening will fit a 1" square charger. Please remember to include your email address so we have a way to contact the winner! How to Enter: Visit Anna Tere Designs, pick your favorite item and leave a comment on this post about it. (Scroll to bottom of post and click on Comments) Make sure you include your email address so we have a way to contact the winner! For Bonus Entries: Please leave each in a separate comment, as each comment is an entry (To qualify for extra entries you must do step one above by including your email address). 7. 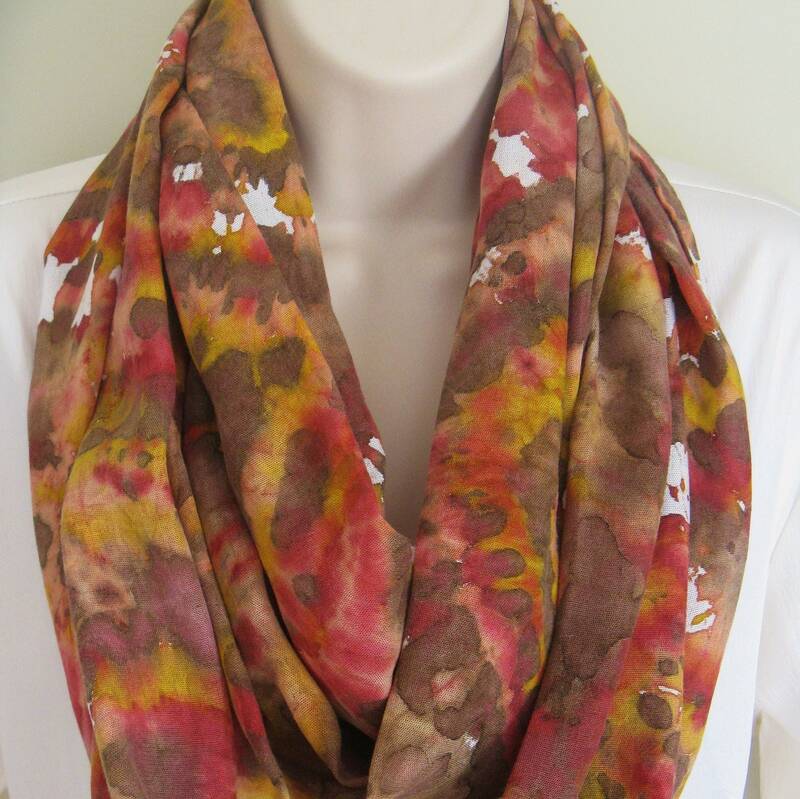 Become a Facebook Fan of Anna Tere Designs. Comment back here with your Facebook name. Existing fans just leave your Facebook name here. Contest ends Saturday, November 3rd, at 12:00 noon Central. One winner will be chosen by Random.org. Here we are at the peak of a golden fall, and just around the corner it's the HandmadeMN Fall Market — next Saturday, Oct. 27, at the Ballentine VFW in South Minneapolis. Have you heard? 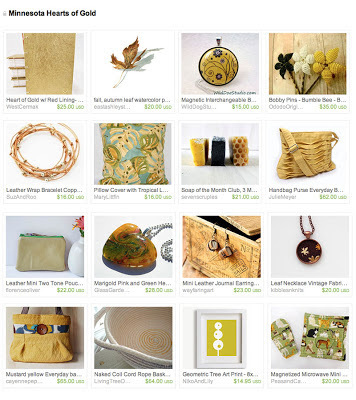 So I started perusing the many fine participants listed right here (it's so easy to click on each one and do a little advance window shopping), and soon found myself gathering together a collection of excellent golden-hued items like a lovely autumn bouquet. All of these crafters and more will be at the market, so here's a little glimpse of what you'll find there. Fun, huh? This week's giveaway is from Vicki of 7 two 7 Glass. She is giving away this fun glass pin! This unique glass pin is made with two layers of fused glass and decorated with a vintage image: ZURICH. The image is fired-on and smudge-proof. 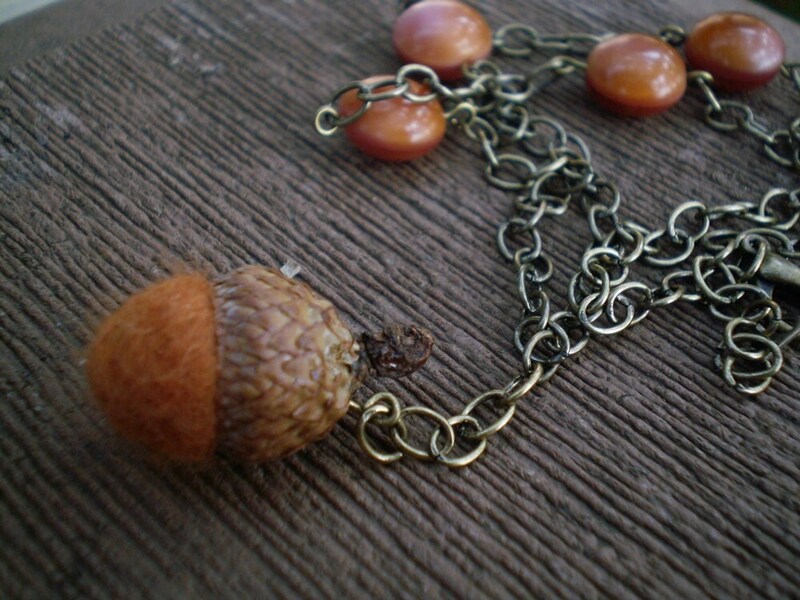 What a fun and funky little accessory! 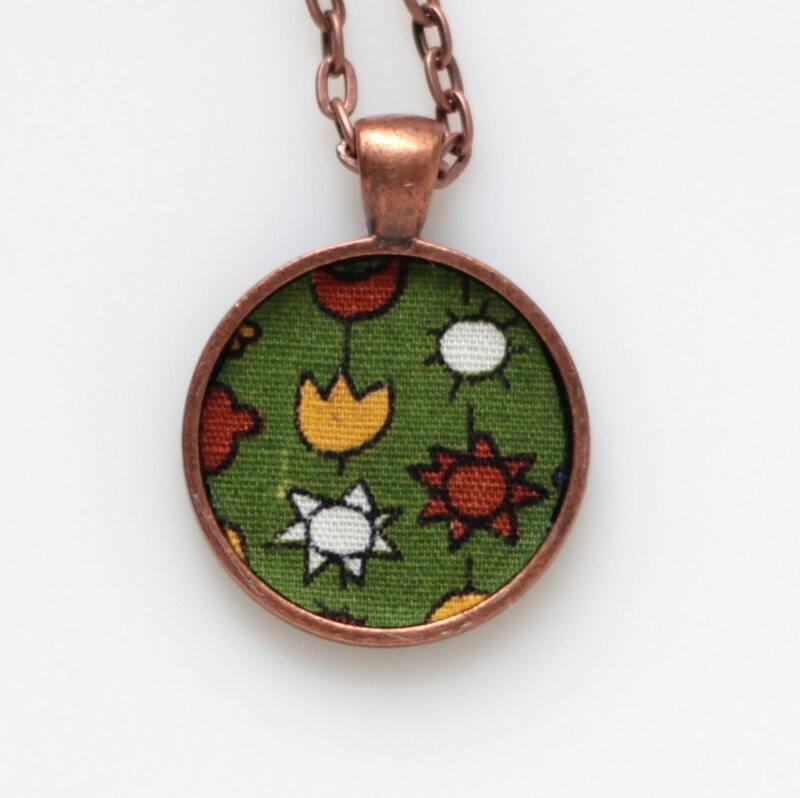 Something different for yourself or a whimsical gift. Contest ends Saturday, October 27th, at 12:00 noon Central. One winner will be chosen by Random.org. 7. Become a Facebook Fan of 7 two 7 Glass. Comment back here with your Facebook name. Existing fans just leave your Facebook name here. October is Breast Cancer Awareness month. According to the National Breast Cancer Awareness Foundation, 1 in 8 women will be diagnosed with breast cancer in their lifetime. Breast Cancer is the number one cancer among women worldwide. The good news is that death rates from breast cancer have been declining since about 1990, partly due to screening and detection, increased awareness, and continually improving treatment options. 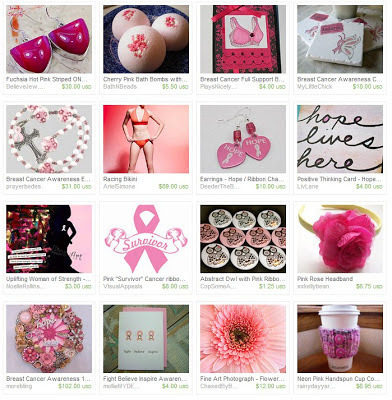 Many Minnesota artists are supporting the cause by offering breast cancer related products. Enjoy the treasury and the shops. 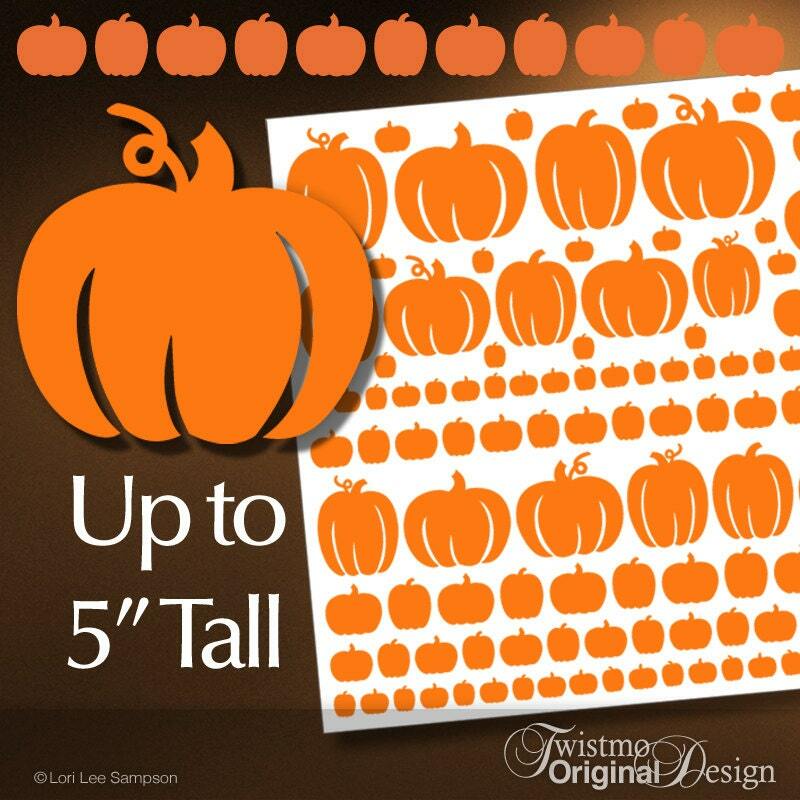 This week's giveaway is from Shelley of Bell Bloom Design. She is giving away Custom Wall Letters. These custom letters are handmade embellished, textured, hanging wall art. Add some dimension and flair to your child's room or nursery with Shelley's handmade, whimsical, wooden letters! 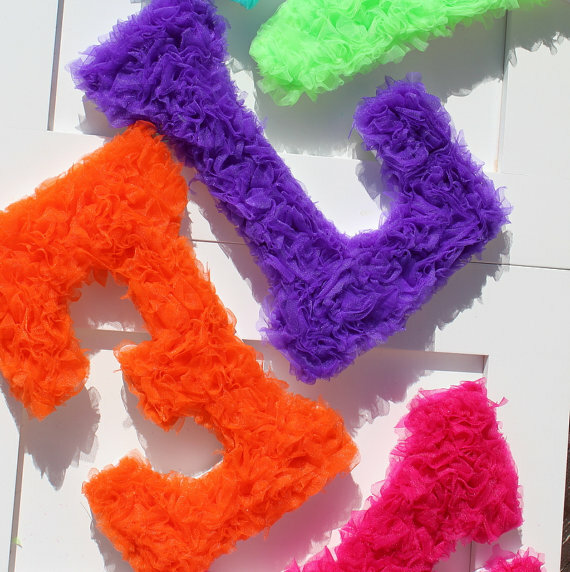 These ruffled, textured letters will give life to your child's name and add interest and uniqueness to the room! The letters stand 9 inches tall and can be set on a shelf to lean against a wall or they have nail holes for hanging directly on the wall. How to Enter: Visit Bell Bloom Design, pick your favorite item and leave a comment on this post about it. (Scroll to bottom of post and click on Comments) Make sure you include your email address so we have a way to contact the winner! Contest ends Saturday, October 20th, at 12:00 noon Central. One winner will be chosen by Random.org. Temperatures plummeted here in the Great White North this week. These local shops are here to help keep you warm! 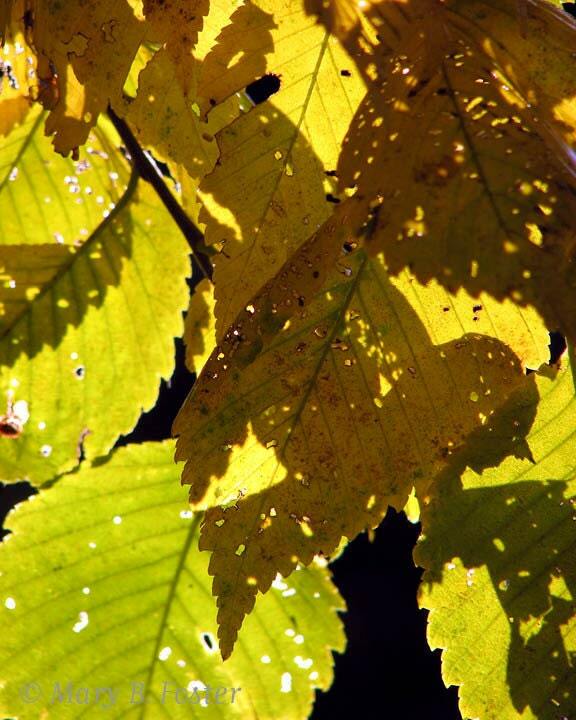 This month's challenge theme is FALL. to the bottom to vote for your favorite! Voting ends at midnight on October 15th. Vote For Your Favorite Now!